Minimum 3 Characters. Maximum 15 Characters. Alphabets Only. If the connector stops working because of a change in the underlying platform, will I need to purchase the connector again? No, our developers keep the connectors up-to-date. Please visit our website and download the latest version. The existing license will still work. Is there a perpetual license model? No, we only provide subscription licenses. How does the connectors’ licensing work? Will the same license key work for all the connectors? Each connector needs a unique license key and it can be used with only one Alteryx connector and on one Alteryx instance at a time. What all data can I fetch with the connectors? Every connector offers different capabilities, provided by the underlying platforms’ APIs or SDKs. Please visit our site to get more details about our connectors. Can I request a customization in a connector? 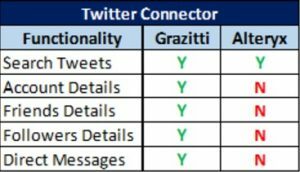 How is the Twitter connector developed by Grazitti different than the out-of-the-box Twitter connector by Alteryx? Who will provide support for these connectors – Grazitti or Alteryx? Do I get these connectors when I purchase Alteryx ? What all connectors are available? There are 45 connectors currently available, with a roadmap for 100+. Our wide variety of connectors cover social media platforms (Facebook, Twitter etc. ), online advertising (AdWords, Adroll, Bing Ads etc. ), social marketing (Facebook ads, Twitter ads etc. ), databases (BigQuery, Aster etc.). Please visit our site https://alteryxconnectors.grazitti.com/ for the complete list of connectors and their details. What is included in the trial version? The trial version offers a fully functional connector license with a validity of 14 days. I want to purchase a bulk license? What discount can I get? Please get in touch with sales@grazitti.com to get the best deal. Are these read only connectors or can they be used to write the data back? As of now, only 3 connectors offer write back (output) functionality – Qualtrics, Aster and BigQuery. Rest all are read only (input) connectors. However, we can customize/build any connector on demand. Are these connectors configurable? How can I get the credentials? All our connectors are supported by documentation and user guides which explain the process of configuring the platform and getting the credentials. Any charges related to the platform or fetching data will be borne by the end user. Any subscription to Grazitti’s connectors does not cover the platform charges. Would I need to enter the credentials every time I use the connectors? Credentials have to be entered every time you drag a new connector to the canvas. However, when you save the workflow, the credentials will be automatically saved and you will not have to enter them again when you open/run it next time. How secure are these connectors? How do you ensure data security? How can I purchase a connector? Can I get a live demo? I need some help.. I need to extend my trial, can I do that? Sure, please get in touch with us at connectorssupport@grazitti.com. Our customer support would be happy to assist you. I need a connector which is not on this list. You can send a request at connectorssupport@grazitti.com or contact our Support. We will try our best to include it in our roadmap. © 2019 Grazitti Interactive. All rights reserved.